The Services consist of interactive features and area that allow users to create, post, transmit, and/or store users and users’ contact’s names, addresses, phone numbers, emails, or other materials (collectively, “User Generated Content”). You understand that your User Generated Content may be used for marketing purposes and for making real estate agent recommendations. You agree that you are solely responsible for your User Generated Content and any claims arising therefrom, and that Lighthouse is not responsible or liable for any User Generated Content or claims arising therefrom. While we are not obligated to do so, we reserve the right, and have absolute discretion, to review, screen, and delete User Content at any time and for any reason. You retain all ownership rights in your User Generated Content. However, your User Generated Content is not confidential or proprietary. By submitting User Content to Lighthouse, you hereby grant us irrevocable, nonexclusive, worldwide, perpetual, royalty-free, sublicensable, and transferable license to use, reproduce, modify, adapt, edit, public, create derivative works from, distribute, perform, promote, exhibit, and display such User Generated Content in any and all media or distribution methods, now known or later developed. No use of User Generated Content shall entitle you to any compensation from Lighthouse, or any other companies, organizations, or individuals. You are solely responsible for your User Generated Content, your interactions with other users and your activity on the Platform. You agree that you will not take any action or post anything that may expose Lighthouse or its users to any harm or liability of any type. Do not post User Generated Content, or a link to a website, that, in Lighthouse’s sole discretion, is illegal, offensive, libelous, defamatory, infringing, inflammatory, deceptive, inaccurate, misleading, malicious, fraudulent, false, indecent, harmful, harassing, intimidating, threatening, hateful, abusive, vulgar, obscene, violent, sexually explicit, invasive of privacy, publicity, intellectual property, proprietary or contractual rights, offensive in a sexual, racial, cultural, or ethnic context, will harm or threaten the safety of others, or is otherwise objectionable. You agree that you will not collect, use or post on the Platform the private information of anyone else without their consent or for illegal purposes. Do not post any User Generated Content, take any action or use the Platform in a way that violates any law, would create liability or promotes illegal activities. Do not take any action on the Platform designed to interfere, disrupt, damage, disable, overburden or limit the functionality of any computer software or hardware, or the Platform. Do not post User Generated Content that contains software viruses, programs or other computer code. Do not circumvent or modify any Platform security technology or software. All intellectual property on the Platform (except for User Generated Content) is owned by Lighthouse or its licensors, which includes materials protected by copyright, trademark, or patent laws. All trademarks, service marks and trade names (e.g., the Lighthouse name and the logo) are owned, registered and/or licensed by Lighthouse. All content on the Platform (except for User Generated Content), including but not limited to text, software, scripts, code, designs, graphics, photos, sounds, music, videos, applications, interactive features and all other content ("Content") is a collective work under the United States and other copyright laws and is the proprietary property of Lighthouse; All rights reserved. Lighthouse does not prescreen User Generated Content. Lighthouse does not guarantee the Platform will be free from User Generated Content that is inaccurate, deceptive, offensive, threatening, defamatory, unlawful or otherwise objectionable. Lighthouse is merely acting as a passive channel for such distribution and is not undertaking any obligation or liability relating to any User Generated Content or activities of users on the Platform. Even in the event Lighthouse chooses to monitor any User Generated Content, Lighthouse assumes no responsibility for, or any obligation to monitor or remove, such User Generated Content. Lighthouse reserves the right to edit, remove, or refuse to post any User Generated Content or terminate your registered account for any reason. You are responsible for any actions that take place while using your Lighthouse account. Keep your username and password secure and do not allow anyone else to use your username and password to access the Platform. Lighthouse is not responsible for any loss that results from the unauthorized use of your username and password, with or without your knowledge. 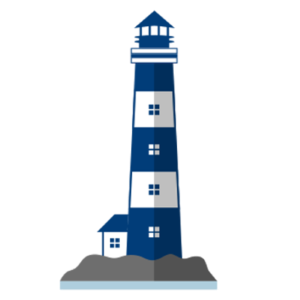 You agree that any feedback, suggestions, ideas, or other information or materials regarding Lighthouse that you provide, whether by email or otherwise (“Feedback”), are non-confidential and shall become the sole property of Lighthouse. We will be entitled to the unrestricted use and dissemination of such Feedback for any purpose, commercial or otherwise, without acknowledging or compensating you. You waive any rights you may have to the Feedback (including any copyrights or moral rights). The Platform contains services and features that are available to certain mobile devices. Your carrier's normal rates and fees apply. Not all mobile services will work with all carriers or devices. By using Lighthouse’s mobile services, you agree that we may communicate with you by electronic means to your mobile device and that certain information about your use of these services may be shared with us. You are solely responsible for your interactions with other people, whether online or in person. Lighthouse is not responsible or liable for any loss or damage resulting from any interaction with other Platform users, persons you meet through the Platform, or persons who find you because of information posted on, by or through the Platform. You agree to take reasonable precautions in all interactions with other users on the Platform, and conduct any necessary investigation before meeting another person. Lighthouse is under no obligation to become involved with any user dispute, but may do so at its own discretion. Lighthouse is not responsible or liable for any User Generated Content or other content posted on the Platform or for any offensive, unlawful or objectionable content you may encounter on or through the Platform. The Platform, User Generated Content, Content, and the materials and products on this Platform are provided "AS IS" and without warranties of any kind. Lighthouse makes no guarantees or warranties related to the performance in any nature of real estate agents that are recommended via the Platform. To the fullest extent permitted by law, Lighthouse disclaims all warranties, express or implied, including, but not limited to, implied warranties of title, merchantability, non-infringement, sales price, time on market, or any other cases, as they may be, that relate to the purchase or sale of any type of real estate or thing of value. Lighthouse cannot guarantee and does not promise any specific results from use of the Platform. Lighthouse does not represent or warrant that the Platform will be uninterrupted or error-free, that any defects will be corrected, or that this Platform or the server that makes the Platform available are free of viruses or anything else harmful. To the fullest extent permitted by law, Lighthouse does not make any warranties or representations regarding the use of the materials or Content in the Platform in terms of their correctness, accuracy, adequacy, usefulness, reliability or otherwise. You understand and agree that you download or otherwise obtain Content at your own risk, and that you will be solely responsible for your use and any damage to your mobile Device, computer system or other Device in which you access the Platform, loss of data or other harm of any kind that may result. Lighthouse reserves the right to change any and all Content and other items used or contained in the Platform at any time without notice. LIGHTHOUSE SHALL NOT BE LIABLE FOR ANY DIRECT, SPECIAL, INCIDENTAL, INDIRECT OR CONSEQUENTIAL DAMAGES, INCLUDING FOR ANY LOST DATA THAT RESULTS FROM THE USE OF, OR THE INABILITY TO USE, THIS PLATFORM, EVEN IF LIGHTHOUSE HAS BEEN ADVISED OF THE POSSIBILITY OF SUCH DAMAGES. YOU ASSUME TOTAL RESPONSIBILITY FOR YOUR USE OF THE PLATFORM. YOUR ONLY REMEDY AGAINST LIGHTHOUSE FOR USE OF THE PLATFORM OR ANY CONTENT IS TO STOP USING THE PLATFORM. THAT SAID, IF LIGHTHOUSE IS FOUND TO BE LIABLE TO YOU FOR ANY DAMAGE OR LOSS WHICH IS IN ANY WAY CONNECTED WITH YOUR USE OF THIS PLATFORM OR ANY CONTENT, LIGHTHOUSE’S LIABILITY SHALL BE LIMITED TO THE AMOUNT PAID BY YOU TO ACCESS THE PLATFORM. Lighthouse is a State of Wisconsin licensed real estate brokerage. Lighthouse provides real estate brokerage services to Clients on a case by case basis. All brokerage relationships are strictly governed by the terms of the agency agreements between Lighthouse and the principals involved as Clients of Lighthouse. Lighthouse also provides Broker Matchmaking Services (“Matchmaking Services”) whereby Lighthouse helps customers of Lighthouse select other commercial real estate agents and brokers for the customers real estate needs. In such cases, Lighthouse receives referral fees from real estate these real estate brokerage companies for sharing your contact information. These real estate brokerage companies do not pay to advertise on the Lighthouse platform and they cannot pay Lighthouse to increase their likelihood of being recommended by Lighthouse. Lighthouse makes real estate broker recommendations based on Lighthouse’s own proprietary decision-making formula. This algorithm includes both objective and subjective data, and is modified from time to time.